Letter: A.S.C.A. Plank-Netten h/o Handelsonderneming Sandra Plank te Renesse. Quad rent renesse is a part of this. Renter: the natural or legal person that on the basis of a lease materials and/ or vehicle(s) of the letter for a certain period. If an entity enters an agreement, the rider of the quad, who submitted his legitimation, is also regarded as a renter. 1. The lease is entered for the time and at the fare specified in the lease or otherwise agreed in writing. 2. The rental fare includes a helmet, unlimited mileage and WA insurance. 3. The renter shall pay the full rent before or at the start of the rental period, including a bail per quad, unless otherwise agreed in writing. Payments can only be made in cash or card payment (Maestro). 4. Repayment of the bale is made after the quad(s) is/are completely undamaged, intact and available again for Quad Rent Renesse. The sum of all paid bail (in case of rent of more than one quad) can, if necessary, be used for the damage to one quad. The letter will respect the implementation of this agreement to a settlement. 1. 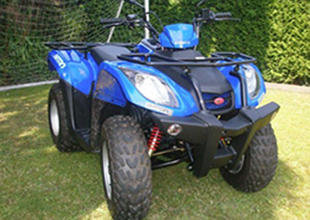 The renter is obliged to return the quad on the return time, return date and return place specified in the lease and in the state in which is received ( with exception of wear which is caused by normal use) with all documents submitted to the quad, keys, accessories, locks and helmets. 2. The quad must be collected and returned by the renter under office hours. Our office hours are daily from 9:00 to 19:00. 3. If the quad is returned (listed on the lease) after the agreed time, there will be a settlement for extra driving time. When picking up the quad, the renter/ driver must submit a double ID, so both driver license/ moped license and passport/ ID. The letter reserves the right to keep a copy of this behind. The letter shall at all times have the right to refuse an agreement without reason or to cancel an agreement after it is signed without the letter can be required of damages. 1. The quad is delivered with a full tank and need to be returned with a full tank. If the quad is not returned with a full tank, you will be charged in addition to the fuel cost 7.50 to treatment. 2. The renter is required to fill up the quad with the appropriate fuel being Euro 95(unleaded). The renter is liable for damages resulting from the refueling of unsuitable fuel. The renter can book one or more quads, provided an amount equal to 50% of the rental fare is paid in cash or by bank transfer to the letter. On booking, the renter must give the period and rent time which he/she wants to rent one or more quads. 1. If there is a cancellation of a reserved quad within two days( ie 48 hours) before the start of the rental period, the renter owes the letter an amount equal to 50% of the relevant rent. 2. If there is a cancellation of a reserved quad within two days to six days before the start of the rental period, the renter owes the letter an amount equal to 25% of the relevant rent. 1. The renter may drive the quad if it is in possession of a valid (moped) driving license and has a minimum age of 16 years. 2. The vehicle may be driven on public roads( paved and/ or dirt). However, it is forbidden to stunt with the quad. It is forbidden to drive the quad on the highway. 3. The renter is required to comply to the applicable legal requirements and traffic rules for a moped. This also means that any time a helmet is worn if the quad is driving. This also applies to any passenger. 4. The renter is not allowed to have the quad used by a driver who has not been named as renter on the lease. If the renter still does this, then the renter is liable for the acts and omissions of the driver, passengers and all others who use the quad or actually hold. This also applies when such action was not in agreement of the letter. 5. It is not allowed to use the quad for pushing of pulling of any other vehicle. 6. It is not allowed to use the quad with more than to persons. When there is no passenger notified for the quad, then a second person is not allowed. If there is still a second person on the quad, it will lead to liability of damages. Besides the right to compensation in such cases, there will be a penalty of 25,- per hour over the entire period that the quad is rented. 7. It is not allowed to drive the quad under the influence of drugs, alcohol, or medicines which will affect the driving skills. 8. The renter need to handle the quad carefully. The renter is liable for all costs, given fines plus a contribution in the administrative and or (financial) consequences of violation of the road traffic and other legislation with the quad, plus a contribution towards administration costs. 9. If the renter is not using the quad, the renter should lock the quad with the supplied extra slot which is contained under the seat. 10. If there is a malfunction during the rental period, the renter must report this immediately to the letter by telephone. The letter ensures that the renter can have a replacement quad. If there is no suitable substitute available, then the renter is entitled to a refund of that part of the rent that they were not able to use the quad. It is not allowed that the renter tries to fix the malfunction by himself or let the quad repair, unless it is expressly agreed in writing between the parties. 11. If the quad is returned earlier than the agreed rime, there will be no refund of a part of the rental. The letter has for the quad(s) an insurance for legal liability (WA). To the extent that there is an excess, it is entirely borne by the renter. The renter declares to be familiar with the fact there are no other insurances covering the quad, such as damage, theft of the quad and/ or accessories. 1. In case of loss or theft of the quad, lock(s), keys, helmet(s) and components during the rental period, the renter of the quad is liable for all damages Quad rent Renesse suffers as a result. Regarding damage will be deducted from the bail and if this is not sufficient there will be more settled from the renter. 2. In case of loss or theft of the contact and/or lock keys there will be 75,- charged. This amount will be deducted from the deposit. 3. In case of loss, theft or damage on the helmet there will be 75,- charged. This amount will be deducted from the deposit. 4. in case of suspected theft of the quad or the intentional infliction of damage by the renter, we will report it to the police. 1. The letter has the right to inspect the quad and accessories on return on new damages. The renter is liable for any damage that might be inflicted and the resulting damages, or without fault of the renter or third parties, regardless of whether this occurs in or outside force. The damage will be deducted from the bail and if this is not sufficient further be passed on the renter. The renter/driver will pay the resulting costs of recovery and the costs of replacement, including those of damaged parts, by the agreed date in cash to the letter. The renter will take all care to limit the damage to a minimum. The letter has the right to determine the costs of the damage by himself. The renter has the right to give rebuttal. 2. In case of damage or loss, whether or not caused by fault of the renter and/ or driver of the quad and occurred with respect to the quad and / or any related documents and/ or any accompanying other case or caused to some third, the renter is required to notify the letter immediately by telephone and in addition to written confirmation. The renter is required to follow the instructions given by the letter and if possible police record of the incident formatting. If the renter does not follows the instructions of the letter, the renter will by this omission possibly suffered by the letter liability. 3. The renter is obliged to inform the letter by any accident, immediately call the police, fill in the damage form and collect all the data of the persons and witnesses involved in the accident and to record the data and possibly take pictures. The renter has to refrain from admitting guilt in any form whatsoever and do not leave the quad. 4. In case of theft and the declaration of total loss as a result of the acts and omissions of the renter/driver, the renter owes the letter a compensation equal to the replacement value of the quad. 5. The renter is liable for all damages, including consequential damage. If the damage is related to the use of alcohol or narcotics, culpable driving the vehicle or driving the vehicle without a valid license or in case of extreme destruction. In particular the renter is liable if the WA damage is not filled in within 48 hours by a fully completed and signed European damage have been reported. 6. The renter indemnify the letter for any damage and / or injuries resulting from the use of the quad to rider(s), passenger(s) or third parties, which the letter can be held liable and which is not subject to the liability insurance of the owner coverage is given of the letter. 7. The renter shall indemnify the letter respect all fines, transactions and administrative sanctions that can the letter and may be imposed in respect of the renter and/ or driver and/ or passenger crimes and violations and/ or whether or not due to improper use. In relation to the letter the renter carries for such fines, transactions and administrative sanctions to the full risk and responsibility and liability. Prior to the rent the renter and the passenger will sign that he has read the above terms and conditions and that he agree.